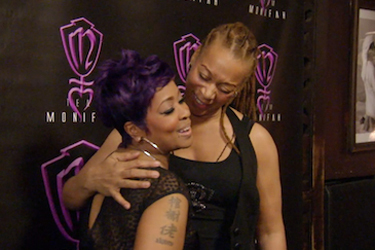 During the season two finale of TV One’s “R&B Divas”, Monifah received the surprise of her life. Her girlfriend Terez came to visit her and suggested that they took a day trip to her hometown of Chattanooga, Tenn.
Super excited about the opportunity to finally see where Terez grew up, Monifah said yes. During a visit to the Tennessee Aquarium, Monifah probed Terez about a final answer to moving to Atlanta with her. Shockingly, Terez told Monifah she would not move to Atlanta as her woman. A baffled Monifah paused and stared at Terez, before she pulled out a black box. “So that means, let’s do it,” Terez said, surprising Monifah with an engagement ring that’s her favorite color, purple. Of course, Monifah said yes while crying hysterically. This is important to see not only because it’s about a beautiful couple who just so happen to be lesbians are sharing such a sweet moment. It also shows the real diversity of this community and showing more and more that certain stigmas around ethnic/racial minorities, specifically the African American community is not always as the media presents it to the public. We wish the happy couple all the best! BREAKING! – Joe Solmonese To Leave The Human Rights Campaign In December – Champers Anyone?